The United States has demanded the “immediate” release of two Reuters journalists detained in Yangon on December 12, amid a growing chorus of international criticism over their arrest and its circumstances. The US was demanding “the immediate release” of the pair “or information as to the circumstances around their disappearance,” Secretary of State Mr Rex Tillerson said at the United Nations in New York on December 15. 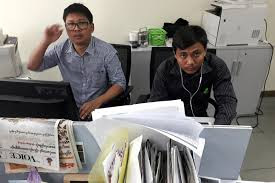 The release of the journalists has also been demanded by the UN, Britain, Sweden, Bangladesh and by media organisations in Myanmar and overseas. The international community must do all it can to have the journalists’ released, UN Secretary-General Mr Antonio Guterres said on December 14, saying the case was an example of the “erosion of press freedom” in Myanmar. Guterres said the probable reason for the pair’s arrest was because they were working on stories about the “massive human tragedy” in Rakhine State. Ko Wa Lone, 31, and Ko Kyaw Soe Oo, 27, went missing late on December 12 after being invited to meet police officials over dinner at Yangon’s outer northern Mingaladon Township. As of December 15, Reuters had not been formally contacted by officials about the detention of the reporters. The Ministry of Information has said that Wa Lone and Kyaw Soe Oo “illegally acquired information with the intention to share it with foreign media,” and released a photo of the pair in handcuffs. The Ministry of Information said on December 13 that the reporters and two policemen faced charges under the colonial-era Burma Official Secrets Act, though officials later disclosed that they were yet to be charged. The 1923 law carries a maximum prison sentence of 14 years. Swedish Foreign Minister Ms Margot Wallstrom said the arrests were a “threat to a democratic and peaceful development of Myanmar and that region”. “We do not accept that journalists are attacked or simply kidnapped or that they disappear,” Wallstrom told reporters at the UN.